REELER is a new highly interdisciplinary Horizon 2020 project involving four European partners from the fields of anthropology, learning, robotics, philosophy, and economics. The REELER project is funded by the European Commission and will run from January 2017 through December 2019. The project is a research-driven collaboration between SSH-RRI and Robotic-ICT communities, which aims to raise awareness of the human potential in robotics development, with special attention to distributed responsibility, human proximity, ethical and societal issues, and collaborative learning. REELER’s high level of multidisciplinarity will contribute to cooperation, comprehension, and acceptance of SSH-research in the robotics research community. The main objective is to develop the REELER Roadmap for responsible and ethical learning in robotics. 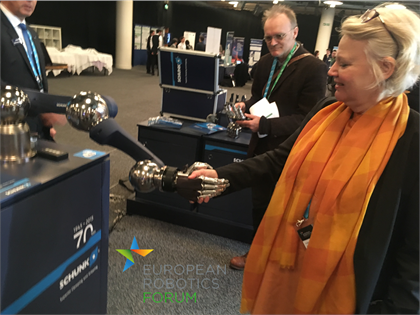 The use of the Roadmap in future robot design processes will enable the European robotics community to more effectively address human needs and societal concerns. Moreover, the project will produce powerful instruments able to foster networking and exploit potentialities of future robotics projects. To join the REELER Network, or to learn more about the REELER project, please read this fact sheet or visit our website. REELER partners and researchers met for the first time in January at the official REELER launch. The 3-day kick-off seminar offered rich opportunities for networking, seeing innovative robot developments in Milan and getting onboard the actual cross-disciplinary work characteristic of the REELER ambition. Read the latest news, here. Ethnographic fieldwork makes up the primary research methodology at this stage in the project. REELER will visit minimum 10 robot sites to observe and interview about processes of design, development and collaboration. The REELER project incorporates cases on the basis of variation within the field of robotics. A focal point of REELER’s research is to observe and interview people who are, directly or indirectly, in contact with robots. The use of these methods will produce knowledge about experiences with robots in real-life settings, which is necessary to achieve one of our main objectives: to better understand human-robot proximity. REELER's consortium consists of four partners from different countries and disciplines (pictured from left to right). Kathleen Richardson (De Montfort University, United Kingdom) is a professor of ethics and culture of robots & AI, and a senior research fellow in the ethics of robotics at the Centre for Computing and Social Responsibility. Cathrine Hasse (Aarhus University, Denmark) is a professor of anthropology and learning and honorary professor in technoanthropology at Aalborg University. She is the project coordinator for REELER. Maria Bulgheroni (Ab.Acus, Italy) is an electronic engineer and R&D Director at Ab.Acus srl, a research-driven, market-oriented company. Andreas Pyka (University of Hohenheim, Germany) is professor and head of chair for innovation economics and Vice President for Internationalization.